EXPEDITION NEWS, now in its 19th year, is the monthly review of significant expeditions, research projects and newsworthy adventures. It is distributed online to media representatives, corporate sponsors, educators, research librarians, explorers, environmentalists, and outdoor enthusiasts. This forum on exploration covers projects that stimulate, motivate and educate. Polar explorer and guide Douglas Stoup, 48, from Olympic Valley, Calif., and amateur adventurer Frank Fumich, 44, from Arlington, Va., will attempt to SUP (Stand Up Paddle) from Cuba to Key West, Fla., non-stop and unsupported later this month. The team hopes to complete the 118-mile paddle in less than 40 hours, all depending on the ever-changing weather and sea conditions. Stoup and Fumich are paddling to raise money and awareness for Stoupâ€™s Ice Axe Foundation, an educational 501(c)(3)established to educate youth about the planet. Adventurers visit students in their schools and bring them along on the expeditions via satellite, connecting students to the surrounding environments and incorporating them into the mission at hand. A portion of proceeds will also go to the Wounded Warrior Project which provides programs and services to severely injured service members. Fumich's adventure c.v. includes summiting the highest peaks on three continents, Ironman Triathlons, and dozens of marathons and ultra marathons, including some of the hardest 100 milers and 150-mile self supported ultras in the world. Fumich recently trekked to the North Pole with Stoup guiding. Later this year Stoup will guide 18-year-old polar explorer Parker Liautaud (see EN, May 2012) from the Messner start – the coast of Antarctica along the Ronne Ice Shelf – to the Geographic South Pole, a distance of approximately 560 miles. The journey between Switzerland and Morocco, which began on May 24, consisted of eight flights – from Payerne to Ouarzazate and back – with Piccard and Andre Borschberg taking turns in the single-seater cockpit. The most challenging leg was from Rabat to Ouarzazate, just beyond the Atlas Mountains, a region rife with turbulence and strong winds. On the return from Rabat to Madrid, Piccard found himself actually flying "backwards,"� having encountered headwinds greater than his airspeed. Piccard and Borschberg's Crossing Frontiers Expedition reaffirmed the reliability of the technologies used to construct the plane and the efficiency of its energy consumption, according to The Explorers Club website, the team carried a Club flag on the flight. Originally built only to prove the feasibility of flying day and night solely on solar power, the HB-SIA prototype, which has the wingspan of an Airbus A340 and is the weight of an average car, is now in the process of collecting a number of distance world records for solar aircraft, being verified by the International Air Sports Federation (FAI) in straight distance, free distance, and distance along a course. Its ultimate challenge is to fly around the world. The wreck of the 187-foot SS Terra Nova,a ship famous for taking Captain Robert Falcon Scott and his doomed party of explorers to the Antarctic in 1911, has been discovered by accident off the coast of Greenland during a test of echo sounders by the Schmidt Ocean Institute. A camera was then sent down to confirm the ship's identity. The Terra Novawas built in 1884, sailed by Scott to the Antarctic in 1911, and later was used by a Newfoundland seal fishery. In 1942 it was chartered to sail supplies to Greenland, but was damaged by ice the next year; the U.S. Coast Guard saved the crew but sunk the ship. "It is remarkable that the Terra Novahas been found now, 100 years on from the race to the pole, the death of Scott and four of his crew, and in the year of various events to commemorate that occasion,"� said one historian. Due to the damage it suffered and the cost of recovery, the wreckage will likely continue to remain at depths of 1,000 feet. In July, a team searching for the wreckage of Amelia Earhart's plane was wrapping up an expedition and feeling downhearted. They had come away with apparently little to show for their $2.2 million worth of efforts. But now those searchers say high-definition video from that trip reveals promising evidence. "We have man-made objects in a debris field," Ric Gillespie told the Los Angeles Timesin an interview last month. And those objects are "in a location where we had previously reasoned where airplane wreckage should be." Gillespie is the executive director of the International Group for Historic Aircraft Recovery. TIGHAR has an exclusive agreement with the island nation of Kiribati to search for and recover any artifacts from the plane wreck – which Gillespie and his wife and search partner, Pat Thrasher, are sure occurred there. But first he needs to search for an estimated $1 million in sponsorship support. He'd like to make use of two submersibles, each with three-person crews. This summer's expedition was supported by Lockheed Martin, the Discovery Channel and FedEx, which moved 30,000 pounds of various cargo over 17,000 miles. Cavers from the cave research unit of the Hebrew University of Jerusalem returned last month from exploring the deepest cave in the world. The cave, known as Krubera-Voronya, is considered the "Everest of the caves" and is in Abkhazia in the south of Russia near the Black Sea. Prof. Amos Frumkin of the Department of Geography at the Hebrew University, who heads the university's cave research unit, said the purpose of the project was to break the world record for cave exploration – an achievement reached when a Ukrainian researcher descended to a depth of 7,205 feet (2,196 meters) beneath the earth's surface, five meters deeper than the previous record. The Israeli explorers worked at depths of from 1,640 to 6,824 feet (500 to 2,080 meters) beneath the earth's surface. "One has to remember that caves are the last place in the world where it is still possible to be the first human to tread on unexplored territory," Frumkin said. Aconcagua mountain, known as the "roof" of America, has a new official height of 6,980.8 meters (22,902.9 feet), a measurement slightly higher than it had more than 50 years ago, researchers said this month. The official altitude of Aconcagua was previously considered to be 6,959.6 meters (22,833.3 feet), according to measurements taken by University of Buenos Aires scientists in 1956. The new height "cannot be compared" to the previous one because "the technology used for the measurement is totally different," Argentine National Geographic Institute, or IGN, scientist Sergio Cimbaro told Efe magazine. The University of Cape Town's Science Department believes that it has found a single dose cure for malaria, which would have been good news for Teddy Roosevelt who was seriously weakened by the disease some 100 years ago. Animal tests also showed that it was not only safe and effective, but there were no adverse reported side effects. Clinical tests are scheduled for the end of 2013. If the tablet is approved in coming years, this achievement will surely usher in a new age for science in Africa, according to the University of Cape Town announcement. It will save millions upon millions of lives on the continent, helping avoid at least 24 percent of childhood deaths in sub-Saharan Africa. The newly formed Gear Institute announced an outdoor gear buyer's resource for credible reviews and in-depth advice by well respected product testers in the outdoor industry. The Gear Institute was founded in 2011 by former Outside Buyer's Guide Executive Editor Justin Nyberg, former Outdoor Retailer and SIA Snow Show Daily Editor Peter Kray, and veteran web developers and outdoor enthusiasts Tal-ee Roberts and Ken Marold. When it was only four months old, the Gear Institute's beta site was selected as one of the top five outdoor gear blogs by Outside magazine. There are openings for product experts – guides, specialty shop employees, industry journalists, coaches, and athletes who know product technology inside and out, and have no conflicts of interest. One reason: Armstrong died in Cincinnati on a Saturday. Not just any Saturday, when news organizations have a skeletal staff, but a late August weekend. It's not a stretch to think inexperience on duty might have played a role in NBC News' embarrassing gaffe: a website headline that read: "Astronaut Neil Young, first man to walk on the moon, dies at age 82." NBC called it a staffer error and said the mistake was taken down after seven minutes, according to Bauder. "His death came as somewhat of a surprise, too. Everyone dies, of course, and most news organizations have prepared material on hand to mark the passing of famous people. In many cases, though, there is advance word that someone is very ill, giving the media a chance to prepare and plan,"� Bauder writes. Armstrong's determined effort to live a quiet, private life after his astronaut days also left TV at a disadvantage, says Bauder. There was relatively little tape on hand to roll from interviews reminiscing about his experiences, reunions with old astronauts or public appearances. No Armstrong chats with David Letterman. No appearances in music videos. There was the moon walk, and not much else. "His death was like his life: strangely muted given the magnitude of his achievements,"� Bauder says. Karnath reports dinosaur remains have proven particularly popular targets as they can be especially lucrative. When in the early 1920s Roy Chapman Andrews came up with the idea of auctioning off an "extra" dinosaur egg to ostensibly help raise the profile as well as fund his next expedition, he unwittingly opened the door to what has developed into new avenues for trade in natural and cultural artifacts. A famous manufacturer of scuba masks, fins, snorkels, spearfishing equipment and wetsuits is seeking expeditions to support with in-kind donation of gear. In return for product, they request a photograph of the gear in use, and a field report they can use on their website and in social media. Six Norwegians have reached French Polynesia on a replica of Thor Heyerdahl's famous Kon-Tikiraft after a 71-day voyage across the Pacific from Peru, following the route of the intrepid explorer 59 years ago. The six-person Norwegian crew – including the explorer's grandson Olav Heyerdahl – set sail from Lima on board The Tangaroaand reached the island of Raroia in Polynesia in early July. In 1947, Thor Heyerdahl made history when he sailed across the Pacific to prove that Polynesia could have been populated by people from South America. Like Kon-Tiki,The Tangaroais an authentic replica of the original Polynesian settlers' papyrus rafts, but used a different and larger sail, and incorporated the latest maritime communications equipment. The effort was sponsored in part by Nera, the Norwegian manufacturer, which supplied an Inmarsat Fleet F77 terminal for essential Internet, e-mail, telephone and fax connections. This enabled the crew to relay its research findings in real time and to communicate with project headquarters. The Tangaroaalso attracted media attention from all over the world. Interviews with the crew, as well as video footage, were beamed live from the middle of the ocean. SPOT Messenger, the satellite rescue device, made a cake for itself and posted it on-line to celebrate facilitating its 2000th rescue around the world. The unit's SOS button has activated first responders, search and rescue teams, and coast guard units in 78 countries when the worst has happened. One example: an Arkansas photographer activated his SPOT after falling 30 feet in a steep ravine in the Ozark National Forest, breaking several bones. "This is one of those things that's not only surprising, but never really even occurred to anyone, as far as we know. According to The Atlantic, when astronauts return from spacewalks, they bring something in with them that sticks to their suits, and gives off "...an odor that is distinct and weird: something, astronauts have described it, like 'seared steak.' And also: 'hot metal.' And also: 'welding fumes.'" The website reports astronauts are remarkably consistent in describing Space Scent in meaty-metallic terms. "Space," astronaut Tony Antonelli has said, "definitely has a smell that's different than anything else." Three-time spacewalker Thomas Jones has put it, "carries a distinct odor of ozone, a faint acrid smell." Jones elaborated, "Space smells a little like gunpowder. It is sulfurous." Comedy Central riffs on Aron Ralston's famed misadventure in a Utah Canyon (See EN, August 2012) in a raunchy, bawdy, irreverent video by American stand-up comedian Tosh.O who dismisses carabiners as "a fancy key chain for frat dudes. "� The skit is web redemption for climber and guide Jason Kruk who a couple of years ago while climbing with a hangover, got his knee stuck and then had something even worse happen. Ralston, who calls himself the "real James Franco,"� jokes he brings a circular saw with him now on his climbs. This is very graphic, uses foul language, discusses sexual situations and is based on potty humor. In other words, it's hilarious. The dinner, one of the Club's major events of the year honoring important explorers, will be held starting at 5 p.m. at Cedar Lake Event Space, 547 West 26th Street, just west of the High Line. 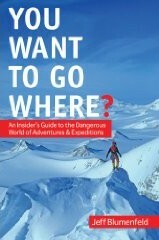 Tickets starting at $375 per person are available to anyone interested in exploration and the honorees through www.explorers.org or by calling (+1) 212-628-8383. EXPEDITION NEWS is published by Blumenfeld and Associates, Inc., 1281 East Main Street – 1st floor, Stamford, CT 06902 USA. Tel. (+1) 203-655-1600, fax (+1) 203-655-1622, editor@expeditionnews.com. Editor/publisher: Jeff Blumenfeld. Assistant editor: Jamie Gribbon. Research editor: Lee Kovel. ©2012 Blumenfeld and Associates, Inc. All rights reserved. ISSN: 1526-8977. Subscriptions: US$36/yr. available by e-mail only. Credit card payments accepted through paypal.com. Read EXPEDITION NEWS at expeditionnews.com. Enjoy the EN blog at ExpeditionNews.blogspot.com.